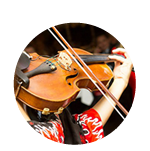 Currently performing with I-Strings Trio/Quartet, made up of her colleagues from York University; Gypsy Flame Show Band; and Baarbad Music. 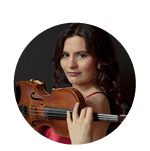 Vira is also an instructor in violin performance, piano and music theory. She composes and arranges music for herself, her colleagues and students. I enjoy working with small chamber ensembles, unique exciting, exotic and solo instruments. It empowers me to achieve the most effective sound, using modern techniques, with the minimal number of performers. While I also enjoy a big show, that is why I am writing a musical, which will feature dancers, singers, actors, and a chamber orchestra – and will be very theatrical and comic. My performance is aimed at blurring the boundaries between the ideals of dance and music. All art is one and in uniting music and dance, I demonstrate how leading elements, such as movement, energy, momentum, gesture, phrasing, and breathing in both transcend the disciplinary boundaries.